Home > U.S. South > 1775 The Western Coast of Louisiana and the Coast of New Leon. 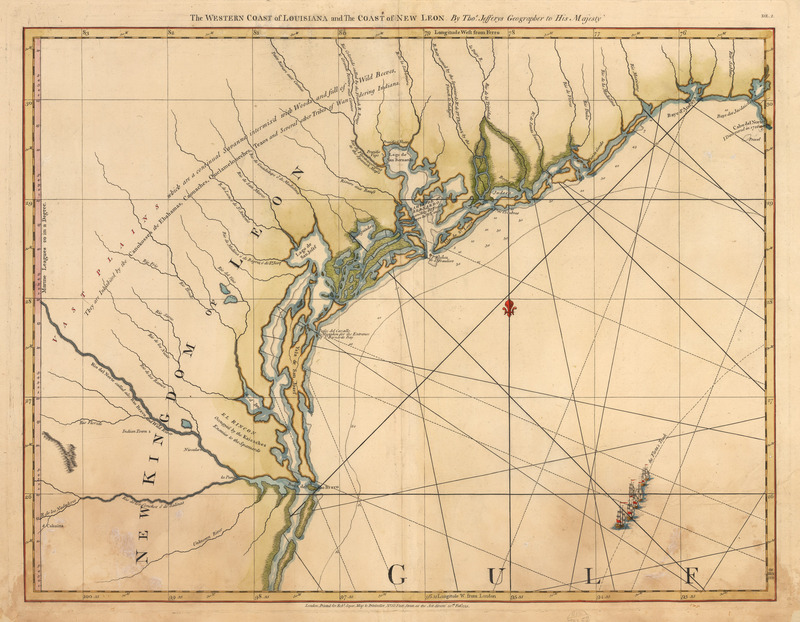 1775 The Western Coast of Louisiana and the Coast of New Leon. A first state example of the earliest map to focus on the coast of Texas, recognized as the “New Kingdom of Leon” This landmark map of the Texas coast presents the area as the “Kingdom of Leon,” and extends from just south of present day South Padre Island to what is now the Vermillion Bay, just south of Lafayette Louisiana. What little detail that can be found in the map pertains to the layout of the barrier islands and coastal tributaries. Depth soundings are sparse, with most of them concentrated around what is now Galveston Island, just south of present day Houston. A fleet of ships can be found in the Gulf of Mexico sailing a course identified as “the Flota’s Track,” a shipping route taken by Spanish Galleons between Mexico and Havana. Condition: This map is in B condition with apparent damp staining and paper loss in the lower corners that have been restored on the verso.